"What Jerome is ignorant of, no man has ever known"
Today Mother Church celebrates the feast of St. Jerome, whose original name was Eusebius Hieronymus Sophronius. He was born in 328 and lived to be 91, passing away in 419. He was born in what is now Yugoslavia but his family sent him to Rome when he was 12, where he got a great education. He loved it there, and took part in all the activities that were there. But he recognized that all the spectacles and such were occasions of sin for him. And so he drew the line. After finishing his studies, he moved to a monastery and then, when that fell apart Jerome lived as a hermit in the Syrian desert for many years. It was in this place where he removed a thorn from a lion’s paw. As a result, the lion remained at Jerome’s side, protecting him from all the dangers in front of him. Thus, one popular image of Jerome is of him with this lion. He left the dessert years later and became a Priest in Constantinople, though his primary interest was always in studying. And so he continued his studies, especailly of the Scriptures. Pope Damascus recognized Jerome’s talents, and asked him to translate the Bible from Hebrew and Greek into Latin. And so Jerome created the Vulgate. There’s a lot to learn from this saint. Primarily, he was human; he was known to have quite a temper, but despite this, he loved Christ and the Church immensely. It’s interesting how God gives people different gifts to further his kingdom; Jerome was not a “teddy bear”, fuzzy bear, tender priest. No! He had anger; he had rage. And it showed. But he used this gift to fight the heresies of the time. And Mother Church was strengthened because of this one man and the kind of personality trait that tends to rub people the wrong way. His writings were to-the-point and defended Mother Church well, in addition to challenging the faithful to follow Christ better. He particularly challenged those who served the Church as monks. We have a lot to learn from this saint’s example. 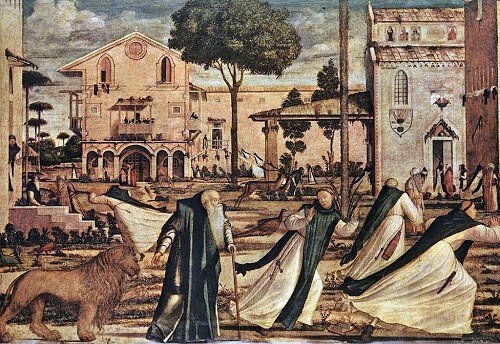 St. Jerome: Pray for us! This entry was posted in Bible, Reflections, Saint Quotes, Saints. Bookmark the permalink.